We have talked before on how small businesses can use Joomla to their advantage. Today, we are going to talk on how doctors (who run probably the most and critical important small business in every country) can use Joomla. 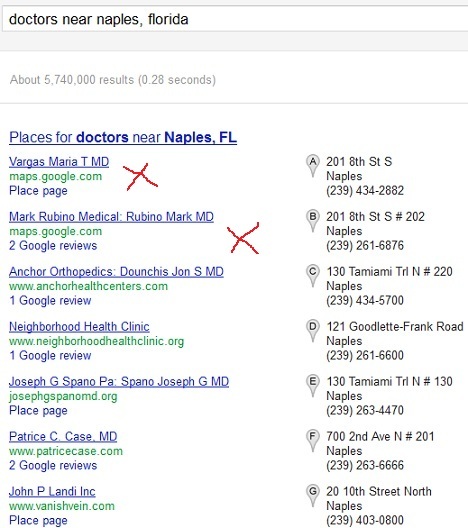 The above is what the person gets when s/he searches for “Doctors near Naples, Florida” on Google. Nowadays, Google lists the businesses that have enlisted with them through Google places before returning the actual search results. This is actually good for the doctors who are registered with Google places, great for those who are registered with Google places and have websites, bad for doctors who only have websites but have not registered their business with Google places, and really bad for those doctors who neither have a website nor have registered their business in Google places. Now let’s examine the above listing further, you can easily see that the first two doctors have maps.google.com as their website address (which is not the case, of course, but Google automatically sets their website to their link on Google maps if they don’t have a website). Now guess which doctor the patients will choose? Will they choose one without a website that they know nothing about, or will they choose a doctor who has a website and whom professional information is public through that website? Now this reason, and this reason alone, is enough to justify why each and every doctor/clinic should have a website (and should list his business with Google places). Now why should doctors go for a Joomla website? Joomla is very easy to use: Doctors only need to create new content/update old content on their website, and this is not hard at all with Joomla, even if they have no technical experience whatsoever. Joomla is everything that they need: Doctors don’t need anything that isn’t supported by Joomla, and they may only need a couple of extensions to add to the Joomla’s default installation so that Joomla satisfies all their needs. Joomla needs little maintenance: A Joomla website needs very little maintenance, and even this maintenance is provided for a very reasonable fee by Joomla support companies such as itoctopus (see our Joomla Maintenance Package). Joomla websites are affordable: Although most doctors do not care about expenses, it doesn’t make sense for them to pay a lot of money for a website while they can pay much less. Since Joomla is free, all the doctor needs to pay to create his website is for the installation/configuration of his Joomla website (Note that the doctor has to also pay for his template in case he opted for a paid template). And that’s it! Now what is the typical structure of a doctor’s website? Homepage: The page that (usually) visitors see first when they visit the doctor’s website. This page contains a brief information about the doctor and his area of expertise. This page typically includes a photo of the doctor. Meet the Doctor: This page contains detailed information about the doctor: his/her educational background, his certificates, and his professional associations. Meet the Staff: Doctors don’t usually operate alone, they have a staff behind them. This page lists the staff, mainly nurses and receptionists. The staff may also include other junior doctors serving with the main doctor in his clinic. Clinic Hours: This page lists the business hours of the clinic. Most clinics are open from 8 AM to 3 PM on regular days, from 9 AM to 12 PM on Saturdays, and they close on Sundays. Ideally, this page will list the non-working holidays (for example, Christmas) so that patients will know that the doctor is closed during these days. Directions/Contact Us: This page contains the full address of the clinic, and it may include a map (such as a Google map). The page also lists the clinic’s coordinates such as the phone number, fax number, email, etc… Additionally, this page usually includes a form that patients can fill in to contact the doctor directly. A doctor websites may also include other pages that consist of authority articles written by the doctor on topics concerning his profession. Now if you are a doctor, and you need help building/managing/extending/maintaining your Joomla website, then feel free to contact us. Our fees are reasonable, we are very friendly, and we are always there (we even offer 24/7/365 Emergency Joomla Support).